Booking a short break in winter has always been subject to the weather. I decided not to bother checking, booked accommodation and we’d just go anyway. Otherwise we might never go. 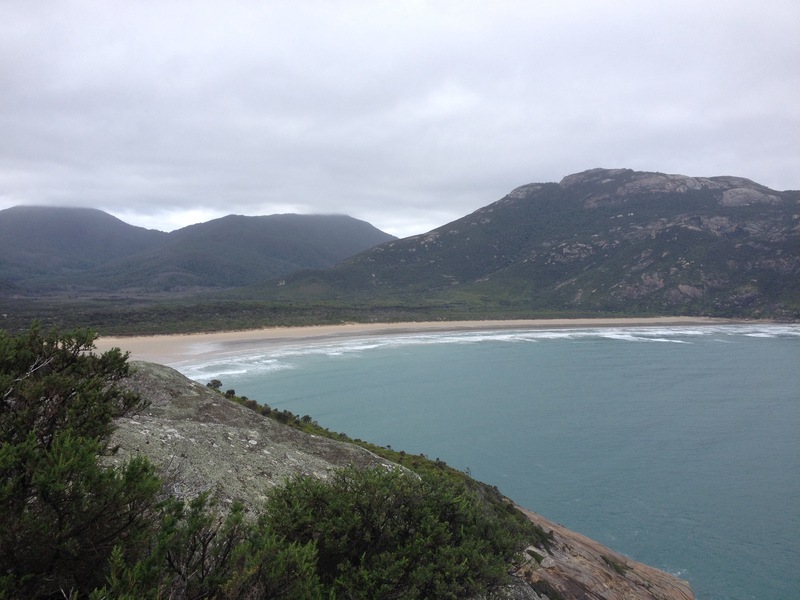 Wilson’s Prom has been high on my list of places to see in Victoria for some time. It is home to lush rainforests, unspoiled beaches and every Australian animal you could hope to encounter in the wild. It didn’t matter that rain was coming down in lakes when we left. It continued to do so as we drove further and further from civilisation. Thick drops of rain pummelled the windscreen. The freeway became a highway. The two lane road snaked between villages with names like Koo Wee Rup, Kurrumburra and Woop Woop. Enormous stock trucks would pass us, driving at high speeds in the opposite direction. Spray flew across the windscreen, removing all visibility for a few seconds at a time. 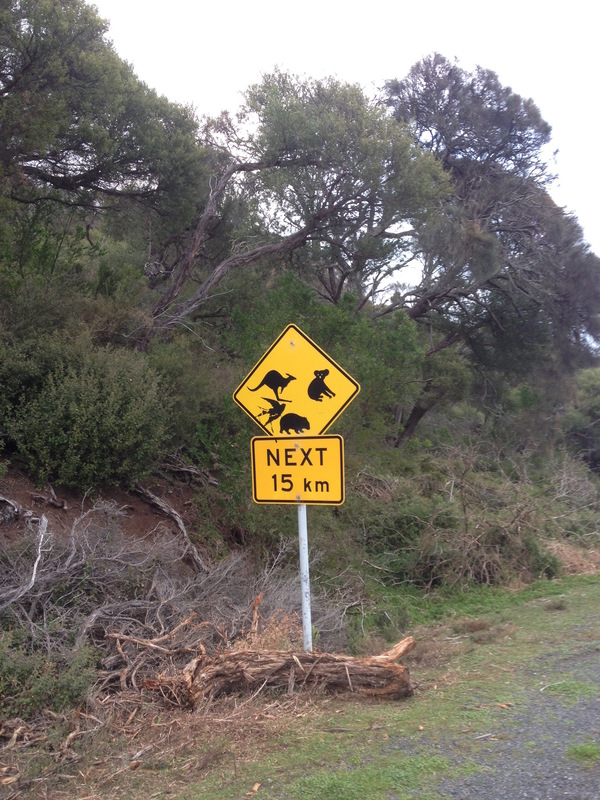 Signs appeared warning, or advising of koalas in the trees, kangaroos in the fields. Nothing gave notice to the pot holes coating the roads. We arrived at Buln Buln cabins in the afternoon. Elena was impressed at how luxurious our accommodation was. I’d already refused to take her camping in winter, I wasn’t then going to put her up in substandard conditions! We had to buy food for a few days and took the only road back towards civilisation. We arrived on the edge of Foster where a man flagged us down. There was a truck stopped in the middle of the road ahead. Two men approach from either end of the car. Part of me was screaming “lock the doors! Lock the doors!” Instead I wound down the window. There were no mobs of villagers waiting to make a sacrifice of city folk to their pagan gods. We parked up near the IGA and picked up our supplies. On the way back to our cabin we found the truck still in the road. We passed around it as per our previous instructions. Driving out of Foster the road was black. We drove on in darkness. Elena flicked the headlights to full beam. The white skeletons of trees came to life at the side of the road. A car pulled up behind us. The headlights were there, in the wing mirror. Then they were gone. I don’t remember seeing a turning. It moved across to the other side of the road. They were back again. Another car roared towards us, bright lights blinding. Elena had just got the main beams back on before we saw it. The biggest koala I had ever seen in the middle of the road. It stopped in the glare of the lights, a few meters in front of us. Elena swerved left. The koala started to run. Something bumped. We were off the road, skidding in the mud. The car came to a stop as those behind us raced past. We were both fine, no damage to us or the car. Nothing physical anyway. What was the bump? We both thought we’d hit the koala. The dark emphasised our shock. We hurried back to the cabin to call for help. Elena’s Mum told us we had to check on the koala, we’d have to go back into the night. The skid marks showed where we’d pulled off the road. I got out with a torch to investigate. There was no sign of the koala. There was no damage to the front of the car either. If we’d had a collision, I think we’d have known a lot more about it. We drove back again, comforted by the lack of injured animals at the side of the road. The following morning we awoke later than planned. When we hit the road this time we turned away from known civilisation. 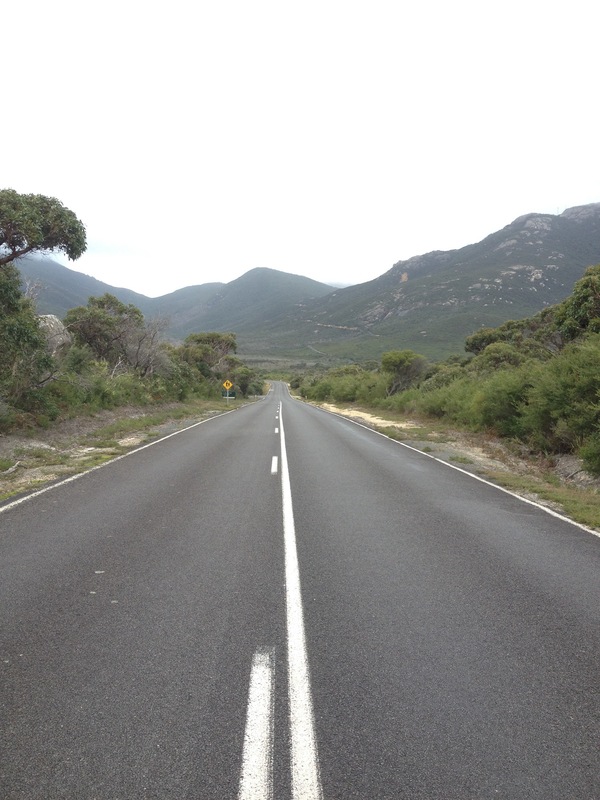 We were driving to the Wilson’s Promontory National Park. 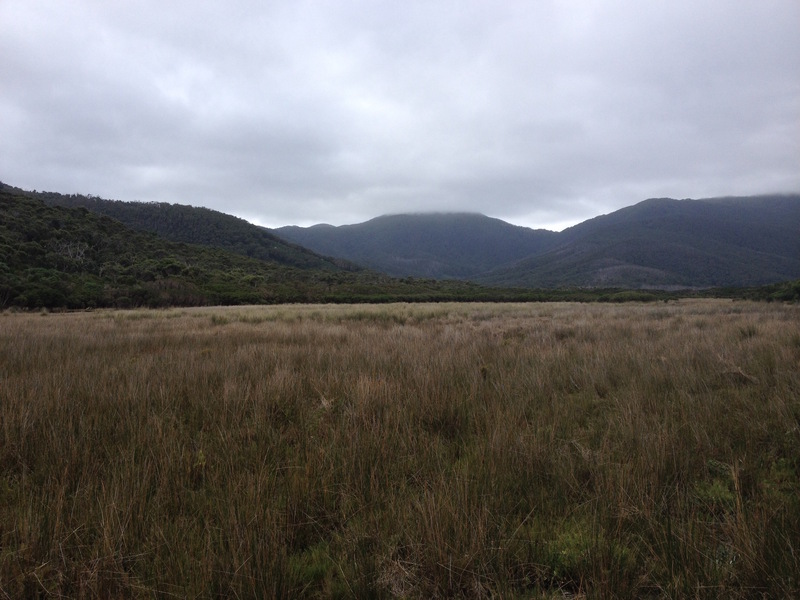 The road snaked for 30km to Tidal River, the closest thing to a settlement within the park. 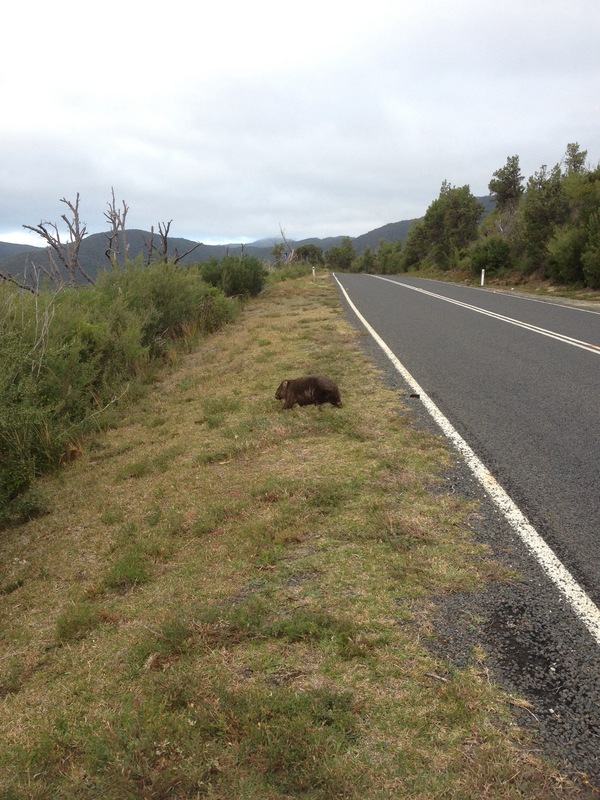 We’d hardly begun when we spotted the first wombat scavenging on the roadside. A little further on came the next surprise. I’d already clocked parked cars as a good indicator for wildlife. I asked Elena to pull over as we passed an abandoned white sedan. In the meadow beyond the road were a couple of emus. 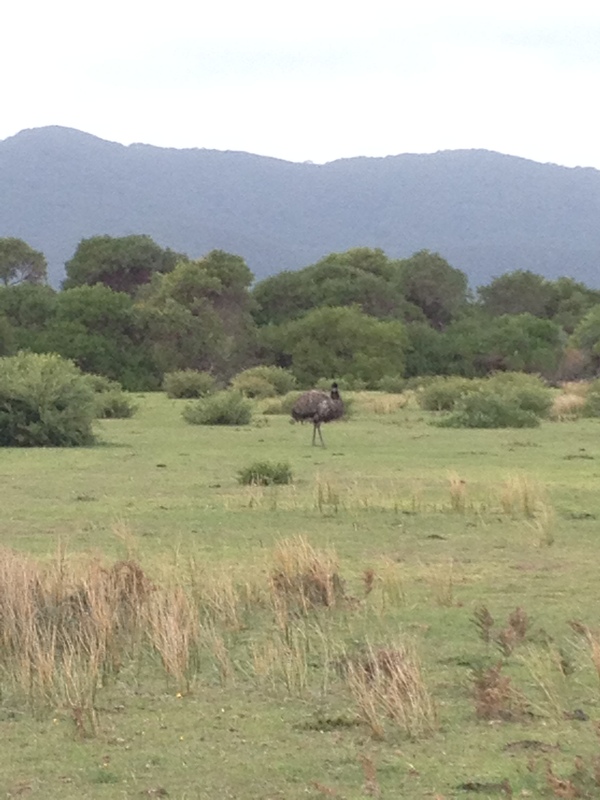 I had forgotten the emu was native to Australia and a common sight on the mainland. These were the first I’d seen. We rolled around mountains with vast plains spreading in the valleys between them. A heavy sky loitered just beyond the peaks. It was not going to be a day for taking in views from the summits. We pulled in to an almost empty car park in Tidal River to figure out our plan for the day. 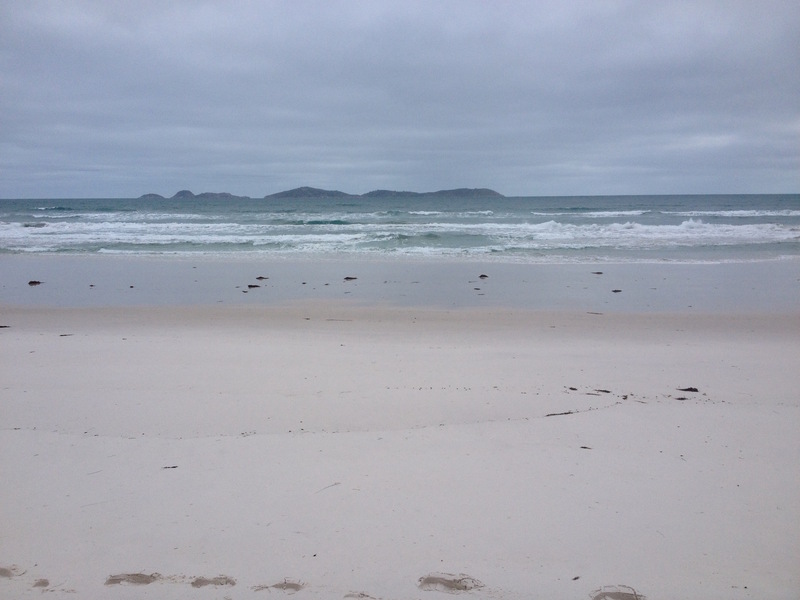 After chatting with one of the staff in the visitor centre, we decided to walk out to the coast and across Squeaky Beach before heading back. We began walking out to Pillar Point. 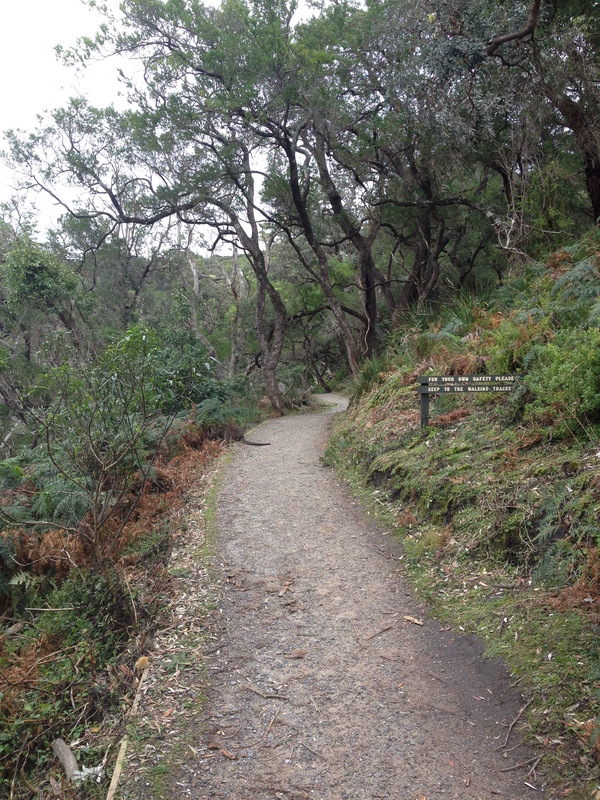 After less than five minutes on the track we almost tripped over a wallaby. It was quite content to sit by the side of the path, watching, waiting. As we got closer it decided it wasn’t so keen anymore, disappearing into the bush. We followed Tidal River up on the cliffs and out towards the Bass Straight. A straight, sandy path led us out to a rocky headland. If we’d been paying less attention we’d have found ourselves teetering on the cliff edge. There were no barriers, not even a sign to suggest the path was about to end. We popped out of the shrubbery and onto an open outcrop. If this was in the UK there was no way we’d be this close death. Where was the local Health and Safety officer? I’m faced with constant suggestions the Australian government have more faith in their public. Did you know Australian super market plastic bags don’t have holes in the bottom? Children grow up fearless. The carrier bag will not kill you if you do not put it over your head. 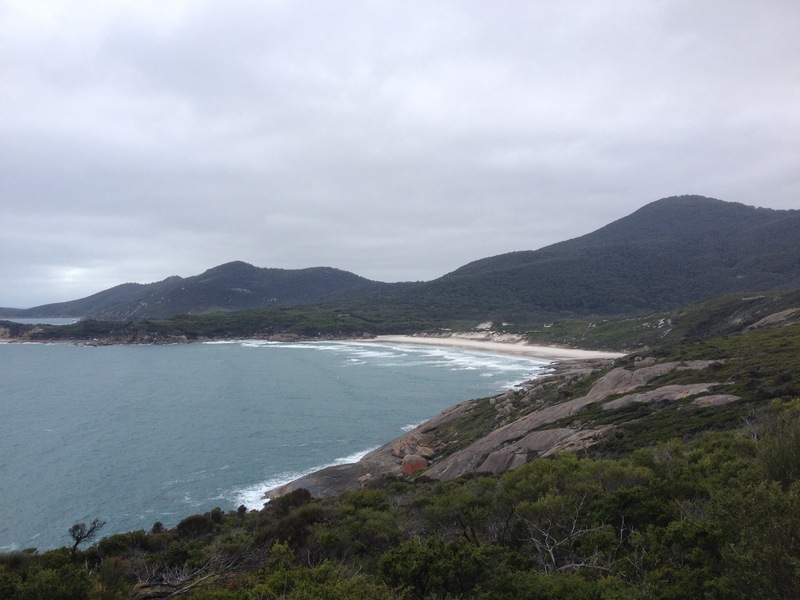 From the headland we had excellent views over Tidal River and Squeaky Beach in the next bay. The mood hadn’t changed. Thick grey cloud creeped down the mountains. It was stunning in the same way the valleys of New Zealand were. Ominous and threatening isn’t so bad if you’re prepared for rain. Our route took us on a trail that stretched back and forth along the side of Pillar Point. A pristine white beach lay in the bay ahead of us. Breakers crashed on the shore. Squeaky Beach gets its name from the sand. When you walk on the tiny spheres of quartz they squeak. Having never been there before, this was a little hard to believe. I couldn’t think of an occasion where sand had squeaked before. Why would this be any different? As Elena and I took our first steps on to the beach, the first squeak destroyed our doubts. It didn’t happen every time either of us put our foot down, but often enough to justify the name. It was squeaky enough for me. We walked along the sand to the maze of boulders at the far end of the beach. 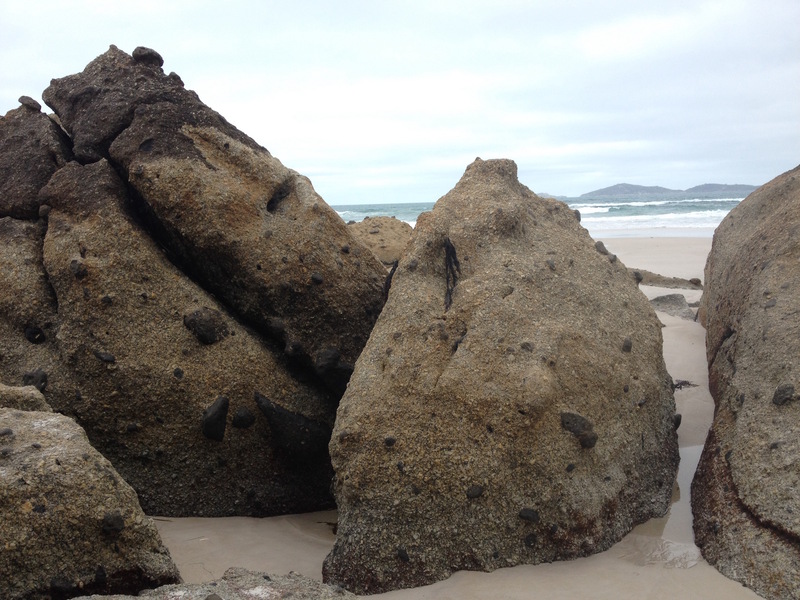 The rocks looked like giant, broken cookies scattered across the sand. There were no more than 20 people on the beach with us. I suspect in the summer it’d be harder to move around. After the beach we strolled back towards Tidal River. We’d seen the rosellas in the car park when we’d arrived. 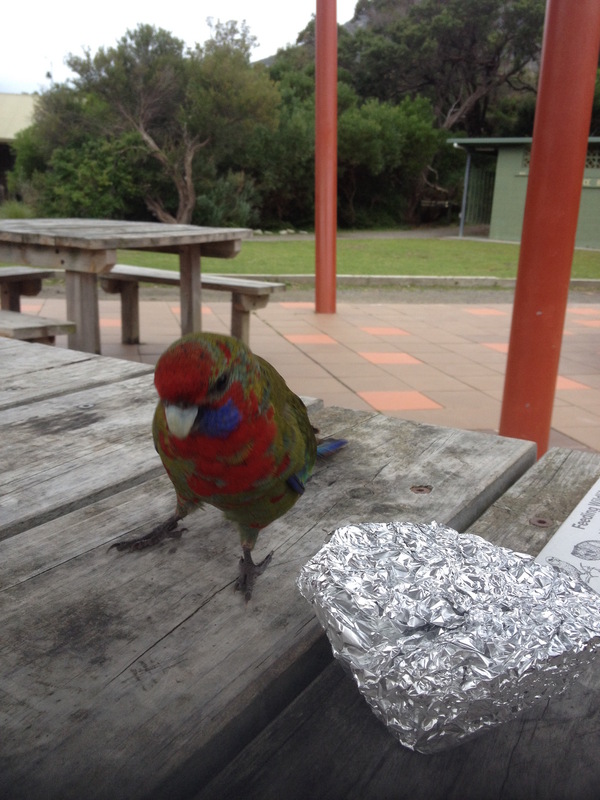 As you know, Elena and I are both pretty keen on birds so we thought we’d lunch outside with them. It didn’t take long for one to land on the table and start making attempts to steal some of our food. More followed in quick succession until they outnumbered us. Elena was soon a perch and feeding station for at least five as they all tried to get a bite of her cereal bar. Not wanting to share our lunch, we gave up fleeing to the security of the car. As the afternoon drew to a close, we took the winding road back to the cabins. We had to stop several times for the wombats by the side of the road. Not because they were a threat, or a problem but because they’re adorable. The common wombat is like a tiny little bear. We found a guy who was happily scratching away at the grass by the side of the road before ambling off into the bushland. Apparently wombats are a bit of a pest to campers. They have a strong sense of smell and will quite happily destroy a tent for a delicious meal. We eventually made it out of Wilson’s Prom and returned to our cabin where we set in for a final night. Wilson’s Prom was a spectacle even in the winter. Without the crowds, we had the luxury of beaches to ourselves and the freedom to go where ever we pleased. I’d love to come back some time in the summer and see the ocean glowing turquoise under the sky. It might be full of other tourists and travellers but I had a pretty good idea as to why. We had a quite evening in our cabin, packing and cleaning as much as we could. 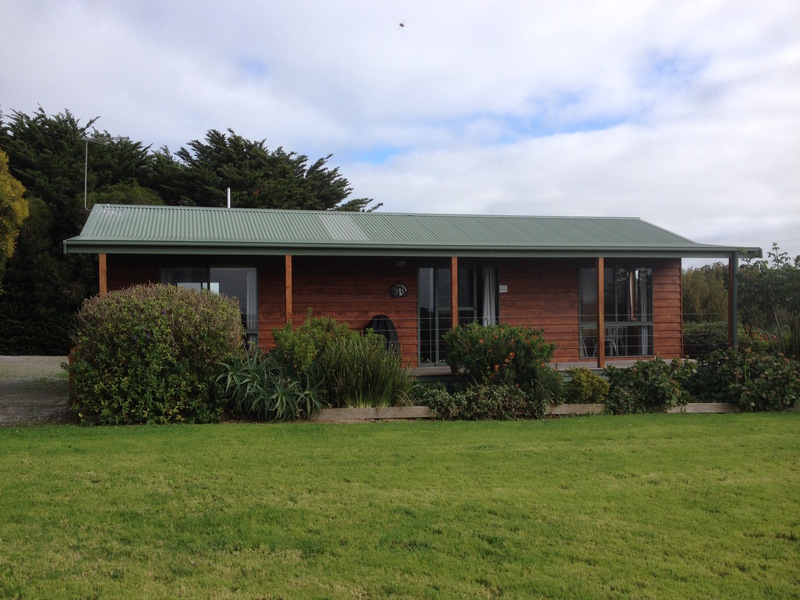 We needed to be up and ready in the morning to drive around the coast to spend the day on Phillip Island. Victoria has some stunning parrots! I love Wilsons Prom even in Winter. Thanks for creating wonderful images to remind me. You’re welcome! Hopefully I’ll get the opportunity to spend more time there one day. Wilsons Prom is always a pleasure to visit, as is Phillip Island, particularly when motor cycle racing is taking place. Both were great, although I’m not sure if I could handle the crowds that come with the motorcycling!